Break in the weather…off to the rocks! A break in the weather at last. I was itching to get out rockpooling as the weather was violent for a few weeks now. Really heavy storms and raging seas. Was hoping that the storms might carry some goodies from the deep up to reachable places. Coral beach was the only place I dared to go as I know it well and even in violent seas the water is still surprisingly clean. I was fairly shocked how many of my favorite pools where almost nonexsistent as they where literally filled up with coral sand. 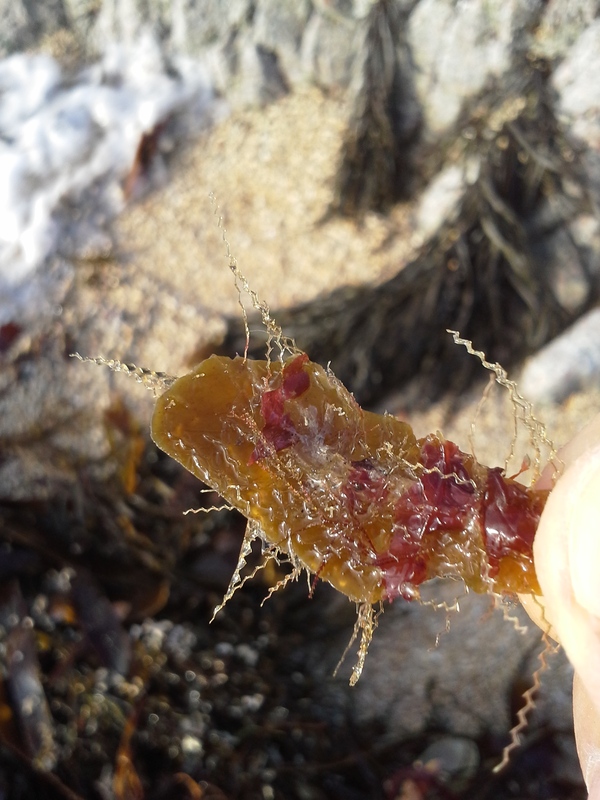 Quite sad as all the critters and anemones etc are basically buried alive 😦 However lots of red seaweeds that I have never found in the intertidal zone where very abundant. Found a weird track that caught my attention and it was from a huge clam that was looking for some water – in the wrong direction. 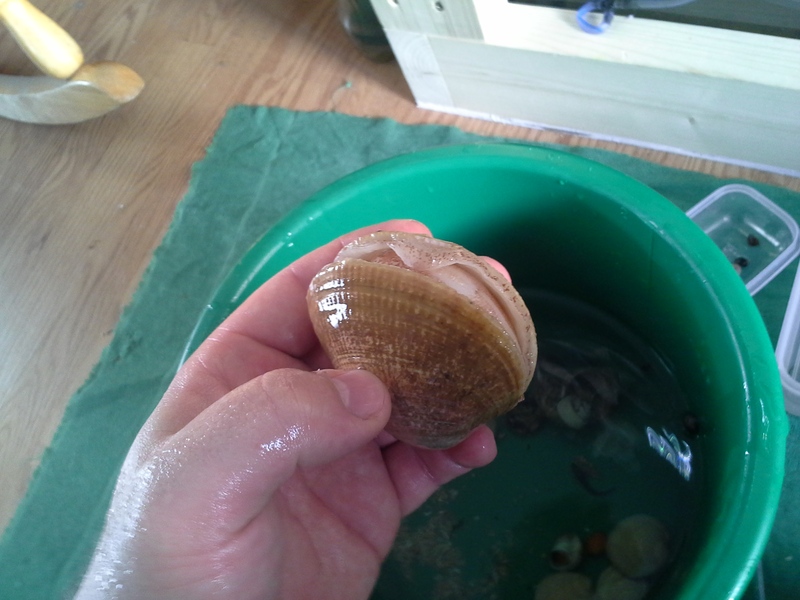 I relieved it from its struggle to find water and put in my bucket 🙂 Nice start, found lots more much smaller live clams. Will have to see if the big one or even the smaller ones have enough substrate to bury themselves. The plan was to find some small prawns and a few two spotted gobies to keep the other one company. 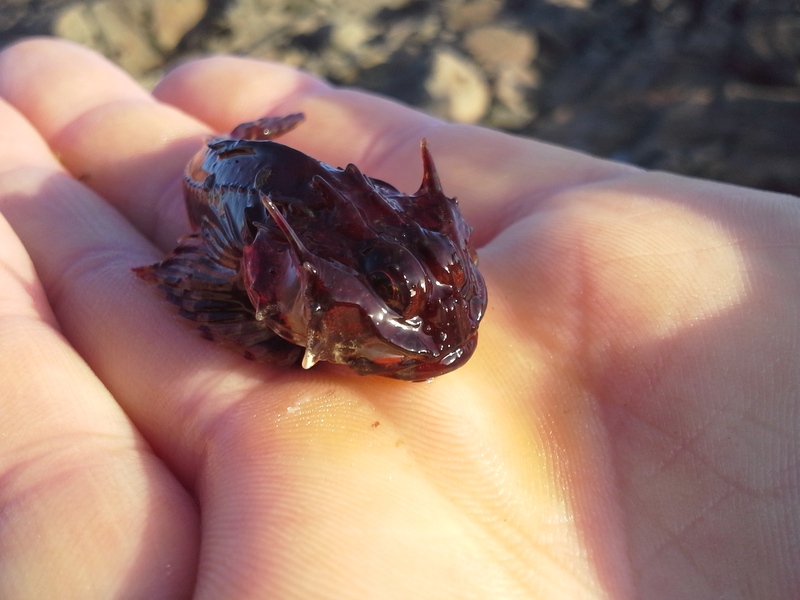 One particular scoop resulted in a 10cm blenny AND a small lovely colored longspined scorpion. Was surprised that they would be so close to each other. Would have loved to bring that scorpion home but their voracious appetite would have me soon regret it. Filter feeders kind of fascinate me and as I have tons of phytoplankton now and don’t know where to go with it I think there is no harm in adding lots of filter feeders like mussels to the tank. Sure the wrasse and seastars will always eat a few anyway. For that reason I scrapped quite a few small mussels carefully from the rocks so they come off like a carpet. 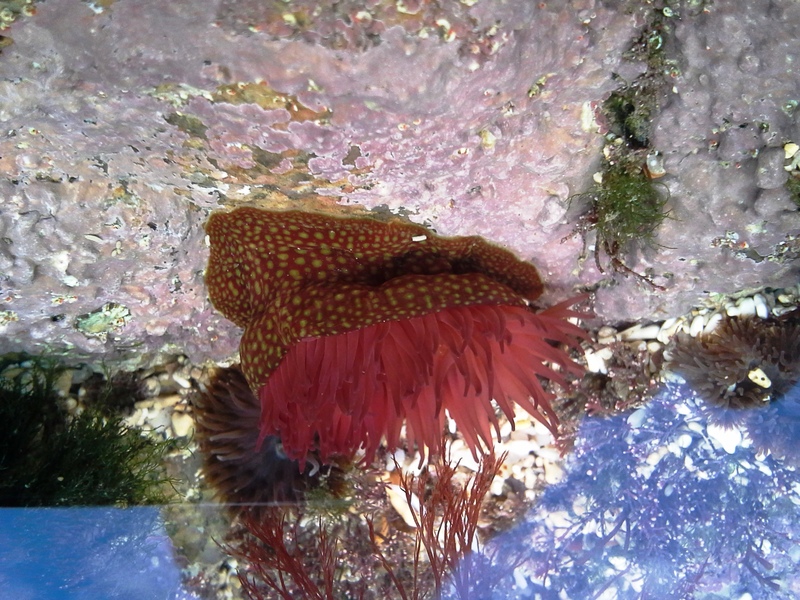 The amount of very specially colored anemones was baffling me as I was in that area a few times. Unfortunately in the beginning I decided not to make pictures but when I found these ones below I had to start! Just breathtaking! I hope I can find it again and try to remove it. 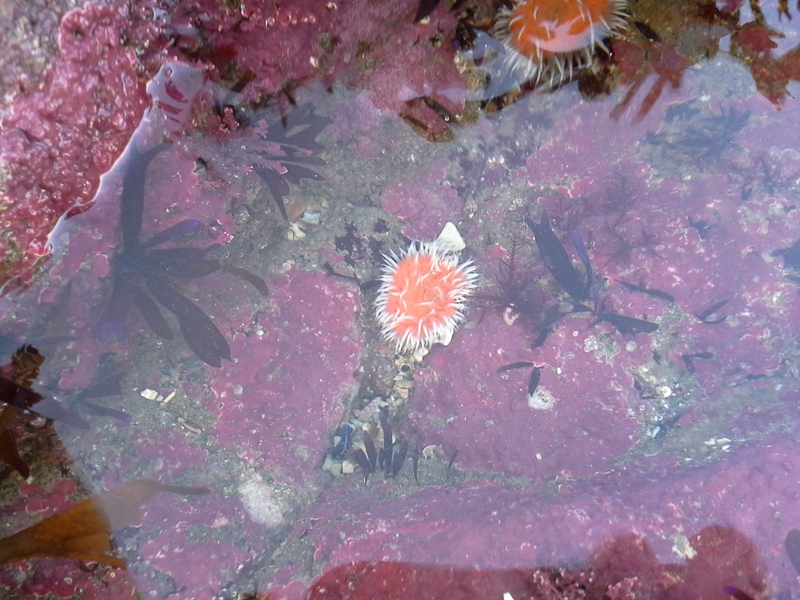 Detaching anemones is fairly time consuming as you obviously cant just force them off the rock and I didn’t want to waste too much time as the tide was rising fast. 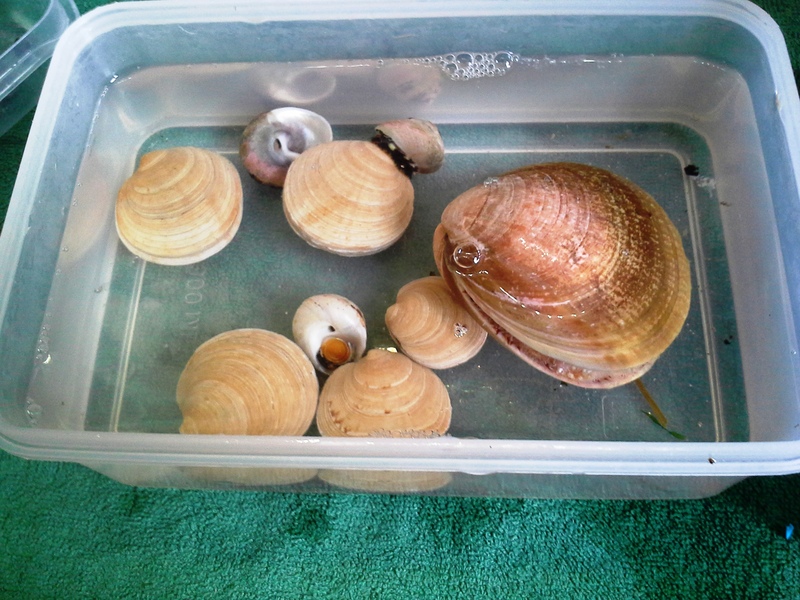 I also dont like doing it, worried I might harm them, prefer to pick them up attached on a rock. 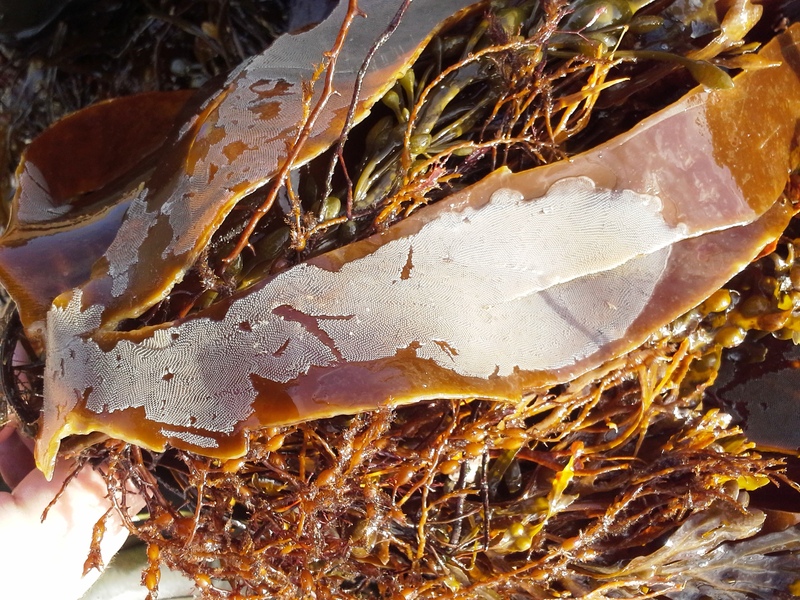 On the way back – the tide was well in by now – I was strolling along the beaches to inspect the huge amounts of seaweed being washed ashore for some surprises. Lots of seaweeds I have so far only seen in books and most of them well covered in bryozooans (left picture – Sea mat) and hydroids (right picture – think its obelia geniculata) Took a few nice red seaweeds to try in the aquarium. All in all a fantastic morning out with lots of impressions and jawdropping moments. 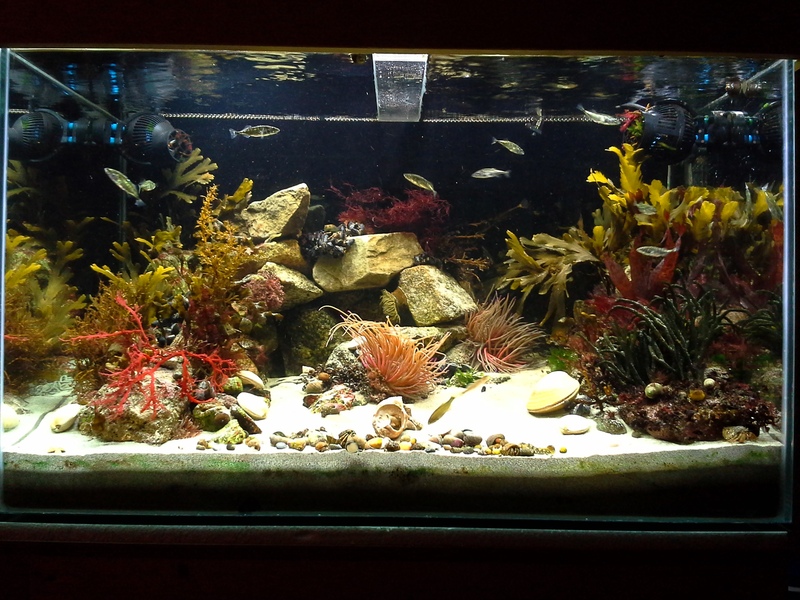 Brought a few more rocks and serrated wrack as I thing the aquarium is not rocky enough and I would like to add some large background seaweeds. After a good bit of arranging rocks and aquascaping this is the result, Looks quite nice now I think. Also gives more hiding places for the fish. Washed up shell with what looks like juvenile clams? 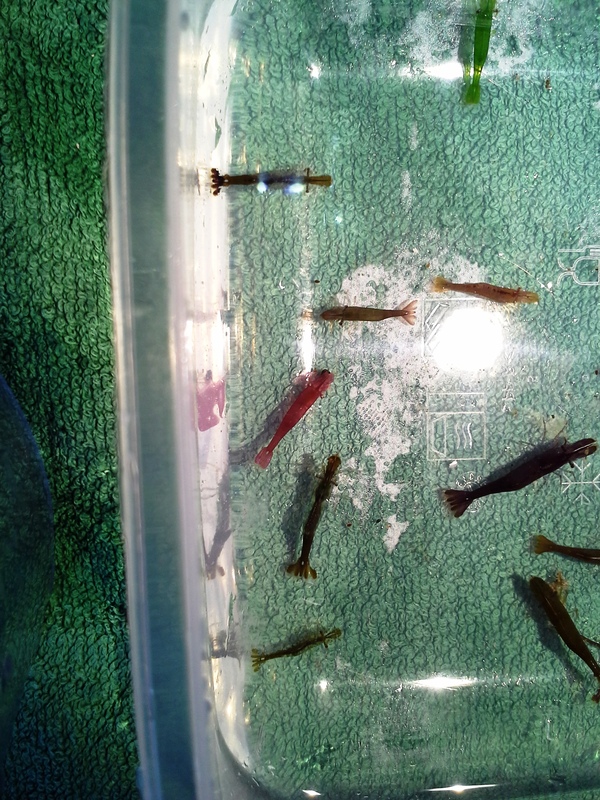 December 30, 2013 in 200l Main tank, Rockpooling etc. MariusMarinusAddictu… on Finally an Update!